Steven (Chicagoland, United States) on 20 July 2010 in Documentary & Street and Portfolio. "The United States Marine Corps War Memorial stands as a symbol of our nation's high regard for the honored dead of the Marine Corps. 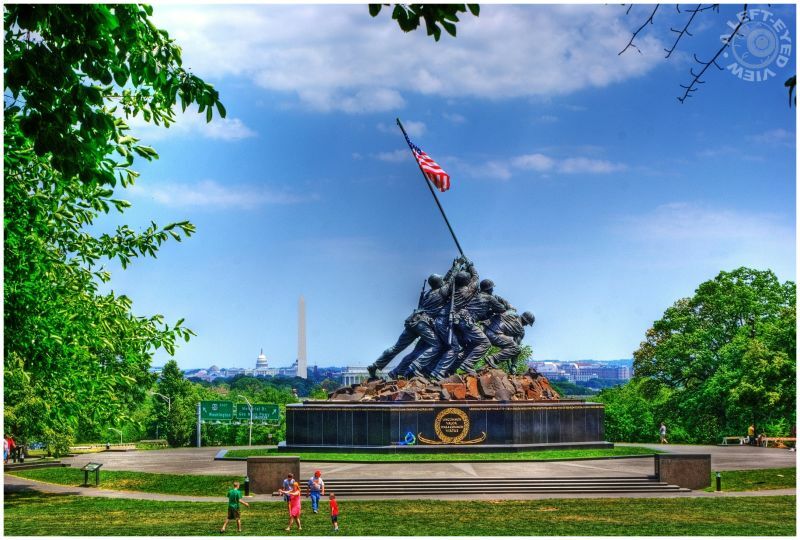 Although the statue depicts one of the most famous events of World War II, the memorial is dedicated to all Marines who have given their lives in defense of the United States of America since 1775...."
At least the signs are green. :) A beautiful natural frame for this impressive monument. How tiny they are. It looks liek a model setting somehow, colors pop. A nuice tribute to those brave soldiers. Superb photo. Light and coulors are very beautiful. Have a lovely afternoon Steven. Fabulous! No problem, the signs almost blend into the trees. I really enjoy this image a lot. Iconic, and the red of the flag really becomes a strong symbol amongst the greens. Stirring stuff no matter how many years go by . . I love that. A monument to bravery. Have you ever wondered why they don't make it like the first raising. It is much more dramatic, in my opinion. Wonderful capture. I like seeing the Washington and Lincoln Memorials and the Capitol in the background. Very beautiful ! and an original angle !